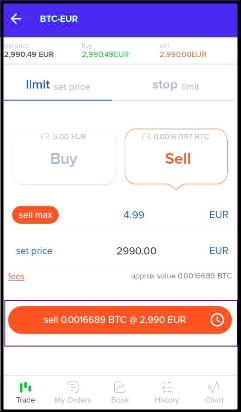 With our current exchange model, when you place a sell order and your asking price is matched by another customer, the order will auto- execute and the funds will auto-credited into your Zebpay account. 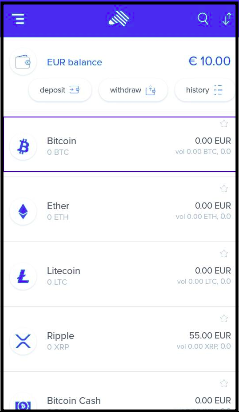 Select the cryptocurrency you would like to sell from the list of coins owned by you. You can set all frequently traded coins as Favourites by selecting the star above the coin's price. Select the pair in which you want to trade. This can be crypto-fiat as well as crypto-crypto trade pairs. Choose the quantity you would like to sell. 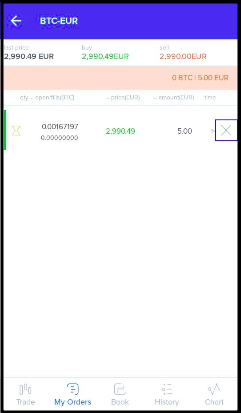 You can change the receiving currency from the right of the quantity entered by tapping on EUR. Execute the trade by tapping on the execute icon (clock within the red tab). 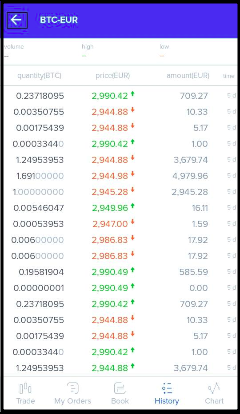 Your SELL order will now reflect on the order book, pending a match. You can view the history of all trades for a coin at the bottom of the trade screen under the History tab.